The Philippines' former President Cory Aquino, passed away at 3:18 AM August 1, 2009, due to cardio-respiratory arrest. She was 76 years old. She was diagnosed with colon cancer last year. Last May, she underwent surgery for colon removal. In June, she was brought to the Makati Medical Center for her loss of appetite, but due to her declining health, she wasn't discharged from the hospital. Cory will be mostly remembered for People Power, the peaceful revolt of the Filipinos to overthrow the current administration and end the Marcos regime. I remember I was a kid then and our family went to EDSA during one of those historic days in February 1986 to witness the people power phenomenon which was being followed worldwide. When she became the president, she was highly looked upon by the world and world leaders being the very first woman president of a nation. She left a legacy that will be remembered for generations to come. 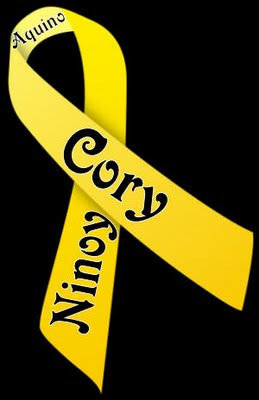 Yellow has been the symbol of Cory and Ninoy Aquino. In homage and honor to your service, allow me to post this ribbon in both your memories. Tita Cory, Rest in Peace. Thank you for the very sad news...but the whole nation already expected the end of her long suffering. REST peacefully now in the lap of our CREATOR, Madame President Cory. You are now happily united with NINOY. We all love you both.